DIAL: Solid gold dial with short black lacquer applied hour markers and gold applied Omega logo and OMEGA printed below. Black baton hour/minutes hands and straight balck chronograph seconds hand. OM SWISS MADE OM (OM = Or Massif, "Solid Gold" in French) printed at the bottom of the dial. CASE: 42mm, 18K yellow gold, burgundy tachymeter bezel, special tribute Apollo XI engraving on the caseback. Numbered 575. CONDITION REPORT: The overall condition is excellent. There are no visible scratches or marks on the dial. The hands are original and untouched. The original DO90 burgundy bezel has faded slightly and has some small marks, but overall intact with no major damage. The case is sharp and unpolished. The 18K 1116 bracelet is also very tight and untouched. NOTES: The Omega Museum archives exctract confirms this BA 145.022-69 was manufactured December 16, 1969 and delivered to Japan. Following the lunar landing, Omega issued its first numbered edition of 1014 Speedmasters: an 18K gold model with a special tribute caseback that was individually numbered. Omega offered, during a banquet in Houston in November of 1969, the first two to President Nixon and Vice President Agnew were refused due to their high value and returned while the following 26 pieces were given to astronauts. 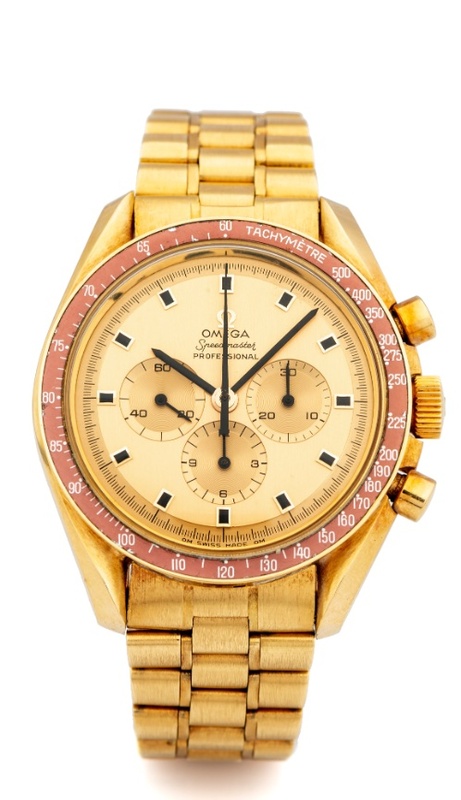 This Speedmaster has several unique attributes beyond its 18K yellow gold case, bracelet and solid gold dial including its burgundy color tachymeter bezel and black hands.